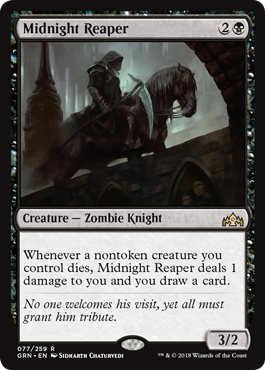 Midnight Reaper isn’t optional, just like all grim reapers, but as long as you keep your life total high this is a fantastic card. It turns all of your other creatures into 2-for-1s, and is great when you’re chumping with things like Child of Night or Burglar Rat. Against removal, this will be the first to die, but it triggers off of itself, making it a 2-for-1 at worst.